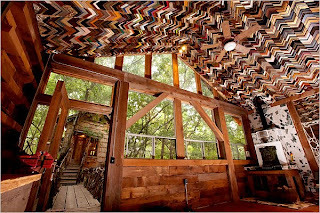 Recycled picture frame ceiling - an exercise in colorful creativity, and thinking outside the box - from a house built using other peoples' trash. Recycle, repurpose, reuse taken to a whole new level. From the New York Times. The recycled ceiling has an amazing pattern. It's perfect. I saw that in the Times-- I even loved his use of old corks. Got a ton of those! I adore the cork floor. I'd love to see a cork backsplash, too.